Overclocking utilities do not currently support the new 'G71' core, and the only way to overclock it is via the Coolbits registry hack (available here). The GeForce 7900GTX core is clocked at a blistering 650 MHz by default. That is the same speed as the Radeon X1900 XTX VPU. Starting with the core first, it was raised in 5 MHz intervals and quickly surpassed the 700 MHz mark. Our core overclocking did not go much higher than that however; at 705 MHz the core failed the driver test and we stopped. Lowering the speed slightly to 702 MHz allowed the MSI NX7900GTX-T2D512E to pass the nVIDIA driver test, and after that the videocard had no difficulty running 3D benchmarks. Next up was the 512MB of Samsung GDDR3 memory, which by default is clocked at 1.6 GHz. With the memory we moved a bit more aggressively by increasing its clock speed in 20 MHz intervals. Inexperienced overclockers are advised go a bit slower... as you can run into trouble quickly. 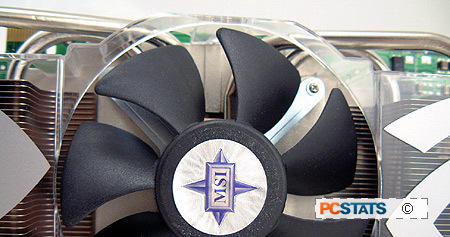 The Samsung GDDR3 memory had no difficulty hitting 1.7 GHz which is the stock memory speed of the GeForce 7800GTX 512MB. In the end the highest the memory would overclock to was 1.77 GHz, anything higher and it would fail the nVIDIA driver test. The core and memory had no difficulty running at their respective maximum speeds. With a third party program like RivaTuner, it's possible that MSI NX7900GTX-T2D512E videocard could go overclock higher if the conservative nVIDIA driver tester is disabled. In any case, an overclock of 702 MHz core and 1.77 GHz memory is decent considering how new the nVIDIA G71 GPU is. As TSMC's manufacturing process improves we can only imagine what that effect that will have on the GeForce 7900GTX's overclockability. The details of how the MSI NX7900GTX-T2D512E test system was configured for benchmarking; the specific hardware, software drivers, operating system and benchmark versions are indicated below. In the second column are the general specs for the reference platforms this GeForce 7900GTX based videocard is to be compared against. Please take a moment to look over PCSTATS test system configurations before moving on to the individual benchmark results on the next page.